Concluding years of difficult negotiations and an intense two-week final summit, representatives from nearly 200 countries today adopted a historic agreement intended to avert some of the worst effects of global warming and shift economies around the world to cleaner energy sources. "History is coming. In fact history is here," Hollande said as negotiators presented a new draft in hopes of reaching a final deal as COP21 comes to a close. The compromise was reached after talks went into overtime beyond an original Friday deadline. An exhausted-seeming French foreign minister Laurent Fabius, who is leading the talks, said the draft is "the best possible balance" and "enables each country to go back home with their head held high." Read the 31-page proposal here , and reactions from environmental leaders below. Reporters Chris Megerian, in Le Bourget, and Alexandra Zavis, in Paris, are covering the summit. This will be our final round of live updates. Catch up on the entire summit by reading our first updates, last week's events and what California's large delegation did while they were abroad. With the Paris Agreement, the world has come together to affirm that clean energy is the future. As we move toward more ambitious action in the decades ahead, we must ensure that America is equipped to lead in the clean energy economy. We will continue to advance the landmark Clean Power Plan that reduces carbon pollution, lowers energy bills, and protects the air our children breathe. The historic climate agreement reached outside Paris on Saturday for the first time commits virtually every nation to reducing the greenhouse gas emissions that cause climate change. The deal comes more than 20 years after world leaders first began meeting to see whether such an agreement could be achieved. It also comes as the sometimes harsh effects of climate change are becoming apparent: Fourteen of the 15 warmest years in recorded history have come in the past two decades. The warming is forecast to continue, and the agreement reached outside of Paris promises that efforts to address it — including more conferences in the years ahead — also will continue. But what does the text actually say about how the world will meet these ambitious goals? What does the goal of limiting warming to 1.5 degrees Celsius really mean, and can it be achieved? How will it all be paid for? Here's our best assessment on that. At a pivotal moment in history, the world's nations stepped up to address an enormous threat to our planet that, if unchecked, would leave our children and grandchildren devastated. I congratulate all the participants at the conference, in particular Secretary of State John Kerry, for their resolve, their cooperative spirit, and their determination to ignore the naysayers. Clean energy will not only stall and then reverse global warming, but it will create millions of jobs throughout the world. “Despite this administration’s desperate effort to demonstrate an international agreement on climate change, some in the international community and some developing nations hope to be flooded with financial resources. The announcement of a final climate deal from Paris is no more significant to the United States than the Kyoto Protocol announcement 18 years ago. While the Clinton administration also signed that agreement, it was never submitted to the U.S. Senate for ratification, and instead, the U.S. Senate passed a resolution against the agreement by a vote of 95-0. “The news remains the same. This agreement is no more binding than any other ‘agreement’ from any Conference of the Parties over the last 21 years. Senate leadership has already been outspoken in its positions that the United States is not legally bound to any agreement setting emissions targets or any financial commitment to it without approval by Congress. China, the largest carbon dioxide emitter, will continue to emit for the next 15 years before even considering taking any action. India, the third largest emitter of carbon dioxide, continues to condition its commitments on getting trillions of dollars from developed nations. After decades of debate, the battle over the reality of climate change is over. Countries from every region of the world and every stage of development have committed to act because they recognize that it is in their self-interest and in humanity’s common interest. The commitment to act by countries including Brazil, China, India, and the United States is a clear sign that countries are no longer focused on whether they should act, but how. “The Paris agreement is testament to America’s ability to lead the world in building a clean energy future where no one is left out or left behind. And it was made possible in part by every person, business owner and community in the United States and around the world that stepped up to prove we don’t have to choose between growing our economy and protecting our kids’ health and future — we can do both. The speech from Venezuela’s delegate after the approval of a new climate deal was a sign of how much has changed since the disastrous Copenhagen convention in 2009. “Everybody remembers me,” Claudia Salerno said coyly during her speech. Indeed, she was hard to forget – during a contentious meeting, she banged her hand so hard on the table that it started to bleed. But on Saturday, Salerno said, Venezuela would support a new agreement to fight global warming, a major step for the oil-rich South American state. Xie Zhenhua, China’s top climate negotiator, echoes the comments of many other delegates: This isn’t perfect, but it’s good enough. The agreement will unlock innovation and investment to reduce emissions and help our communities adapt to climate change. We are far from done, however. Cities generate 80% of the world’s GDP, produce 70% of the world’s greenhouse gas emissions, and house more than 50% of the world’s population. The agreement's ultimate success will depend on local leadership. As mayors, we will redouble our efforts to protect our communities from diminishing air quality, flooding, fires, extreme weather, famine, drought, economic downturn and other profound risks posed by climate change. Last week in Paris, more than 500 mayors and municipal representatives from 115 countries gathered at Paris's City Hall to make clear that cities can and will lead on climate by increasing the energy efficiency of our buildings, expanding renewable energy, adding electric vehicles to our fleets, and leading the search for other solutions besides. Representatives from nearly 200 countries made common cause in the fight against climate change Saturday, adopting an agreement they hope will avert some of the worst effects of global warming and shift economies around the world to cleaner energy sources. The agreement reached at a United Nations conference outside Paris, the culmination of years of difficult negotiations, will mark a “historic turning point,” French Foreign Minister Laurent Fabius said when a final draft was unveiled earlier in the day. Negotiators had been struggling to overcome deep divisions on key issues, including the pact’s long-term goals, how to address the costs of dealing with climate change, how to define the responsibilities of countries in different stages of development and how to ensure that nations fulfill their commitments. The text adopted Saturday aims to limit the average global temperature rise since pre-industrial times to well below 2 degrees Celsius this century, while endeavoring to achieve a 1.5-degree target. That is a more ambitious goal than organizers had set at the outset of the conference and represents a win for countries already suffering the damaging effects of global warming, including rising sea levels, prolonged droughts and extreme storms. A concern about a line in the text stalled the beginning of what could be the final meeting at the United Nations summit. But the issue was ironed out. Delegates are filing into one of the largest halls here for what could be the final meeting of the summit. U.S. Secretary of State John F. Kerry and the top Chinese negotiator are among the major players in the room right now, and former Vice President Al Gore also is making an appearance. The meeting will be an opportunity for countries to share their thoughts on the text of a new international agreement for fighting global warming. If there are significant concerns, delegates could go back to work to modify the text. Democratic presidential hopeful Sen. Bernie Sanders of Vermont was the first candidate to share an opinion Saturday as climate negotiators prepared to consider the final draft of a compromise plan at COP21. “While this is a step forward, it goes nowhere near far enough. The planet is in crisis. We need bold action in the very near future, and this does not provide that,” Sanders said. The self-labeled “Democratic socialist” used his statement to criticize GOP leaders in America as being “more interested in contributions from the fossil fuel industry” than the planet’s future. Sanders also touted his own legislation to cut U.S. carbon pollution by 40% by 2030 and 80% by 2050 from 1990 levels. Should the deal be approved at the conference, expect other contenders to have their say. And the topic is sure to come up in next Saturday’s Democratic presidential debate. It sounds like some of the sticking points from the first draft of the climate agreement have been resolved. After years of difficult negotiations, representatives of nearly 200 countries have concluded what they hope will be the final draft of a landmark global agreement to fight climate change, French Foreign Minister Laurent Fabius announced Saturday at a United Nations conference outside Paris. The new text is ambitious, fair, legally binding, and if adopted, will mark a “historic turning point,” Fabius told delegates, his voice cracking with emotion after nearly two weeks of marathon talks that stretched into overtime Saturday. Negotiators will gather again shortly before a final vote is called. Our story is here . The Paris agreement is a turning point for humanity. This historic moment gives young people hope that a safe climate future is still within reach and the era of fossil fuels is ending. But we’re still on track for a 3-degree warmer world, which paints a bleak future for vulnerable communities. We now have a structure to increase ambition to stay below 1.5, and young people will lead the call to use it. We need to take swift and bold action if we are to have any chance of preventing the worst impacts of climate change, yet this agreement does not contain the mandates and funding to make this happen. It doesn’t mention the words ‘oil’, ‘gas’ or ‘fossil fuels’ at all — all of which we must swiftly transition away from to avert climate crisis. This deal puts the fossil fuel industry on the wrong side of history .... This deal alone won’t dig us out of the hole we’re in, but it makes the sides less steep. To pull us free of fossil fuels we are going to need to mobilize in ever greater numbers. Reaction came swiftly once the final text of the global climate agreement was released, with supporters for an ambitious pact urging national leaders to adopt it but also to consider revisions in the hours ahead. "The agreement’s temperature goal, net zero emissions objective, and processes to steadily increase the ambition of national emissions reduction commitments combine to send a clear message to the fossil fuel industry: after decades of deception and denial, your efforts to block action on climate change are no longer working. Growing public concern about climate impacts, and the availability of cost-effective efficiency and renewable energy solutions are giving leaders the political will to stand up to fossil fuel polluters and put us on a path to create the global clean energy economy needed to avoid the worst impacts of climate change." Fred Krupp, president of the Environmental Defense Fund, declared in a statement that it was "a transformative moment in the long struggle to get serious about climate change." "While the Paris commitments won’t deliver all the emissions reductions that are needed, the agreement provides a framework to ratchet up ambition over time: a transparent system for reporting and review, regular assessments of progress, and strengthening of commitments every five years beginning in 2020," he said. Not everyone was pleased, with Wenonah Hauter,executive director of Food & Water Watch, saying it "falls far short of what is needed to actually address our climate crisis." Read the draft climate accord here . We're on the cusp of a transformative moment. Negotiators have completed what they hope is the final draft, but the text wasn't immediately available. It has been released online here . Officials in Le Bourget told anxious reporters that paper copies won't be ready for the next hour so they should grab coffee and lunch. Here's a view of the workspace where journalists from around the world eagerly await. There will be no putting this off. There will be no possible postponement. The decisive moment for the planet is here and now. In this room, you are going to be deciding on a historic agreement. The world is holding its breath. It counts on all of us. We're expecting a new draft text shortly. All the major players are at the meeting. Besides the United States, perhaps the two biggest players at the United Nations summit on climate change have been China and India. So it wasn’t surprising to see top American officials racing between meetings at both countries’ offices on Saturday morning in the hours before a new draft of a climate deal was scheduled to be released. Todd Stern, the top U.S. negotiator, first met with his Chinese counterpart but declined to speak with reporters afterward. Liu Zhenmin, China’s vice foreign minister, said financial questions have been difficult to resolve. Developed countries are supposed to provide money to poor nations to help them cope with the effects of climate change and pursue clean energy programs, but he said they’ve resisted making the obligations legally binding. “That will be one of the hard issues today," Liu said. Later in the morning, Brian Deese, President Obama’s senior climate advisor, was spotted outside India’s office. “Tense moments, but we’re getting there,” Deese told a delegate. After conferring with Ajay Mathur, an Indian energy official, he raced back to the U.S. State Department offices. Delegates are putting the final touches on what they hope will be the final draft of an international climate deal. French Foreign Minister Laurent Fabius, who has been overseeing the talks, is scheduled to present the document Saturday morning. Nearly 200 countries at the United Nations summit, which has lasted two weeks outside of Paris, could approve the agreement later in the day. The original deadline for the negotiations was Friday, but it was extended amid difficult divisions between rich and poor countries. Talks on an international pact to fight global warming appeared to make progress late Friday, with some negotiators telling The Associated Press a deal was close. Negotiators emerged from meetings with French Foreign Minister Laurent Fabius, the host of the talks, amid an air of optimism that had been lacking just hours earlier. We are pretty much there. ... There have been tremendous developments in the last hours. We are very close. Fabius was expected to present a new, potentially final draft of the elusive accord Saturday morning at 9 a.m..
"We are pretty much there," Egyptian Environment Minister Khaled Fahmy, the chairman of a bloc of African countries, told the AP late Friday. "There have been tremendous developments in the last hours. We are very close." Canada's newly appointed environment minister, Catherine McKenna, seems to have learned a valuable lesson about round-the-clock climate negotiations. The Globe and Mail newspaper reports that McKenna has engaged in late-night negotiating sessions, particularly to smooth over objections from Venezuela and other countries in Latin America regarding carbon trading. French Foreign Minister Laurent Fabius says "all conditions" are ripe to reach a "universal and ambitious" agreement to curb global warming in Paris. "Conditions have probably never been so favorable," he said after day-long meetings with countries and groups of countries to try to find a compromise on the text. Fabius called on the ministers of over 190 countries gathered in Paris to take on their "responsibilities" and move forward in a "spirit of compromise." He said he was making final adjustments to the text in order to be able to present a final draft Saturday morning that could be adopted by Saturday afternoon. As negotiators keep working on the final climate change agreement, a major sticking point may be how to measure, report and verify emissions to ensure that countries are meeting their reduction targets. Some of us have been working quietly behind the scenes to work out compromises …. And hopefully, there’s a consensus and a strong feeling that the best that you can do with such a vast group of nations, 186 people, has been arrived at in a fair manner. And that’ll be the test. China continues to resist a push by the United States and its allies for a more unified approach to a climate deal, arguing that developing countries should be treated differently when it comes to verifying emissions reductions. He chuckled when asked about the “high ambition coalition,” a group of countries that have banded together to seek a more aggressive agreement. The United States, the European Union and some island nations are members, and Brazil announced today that it was joining. “Our commitments have also been very ambitious,” Zhenmin said. Who should pay and what exactly should they cover? One of the sticking points in the talks is climate finance: the questions of how much money is needed for nations to adapt in our changing climate, what specifically the cash should be used for and who is going to pay for it, special correspondent Christina Boyle explains. It's hard to say exactly how much money is needed, but a recent report from the United Nations Environment Program estimated that developing countries would require about $300 billion annually by 2050 to meet all their adaptation needs. One big issue is who pays for what. No one disagrees that different nations have different financial responsibilities and that developed nations should pick up a bigger part of the tab, but when it comes to how exactly the burden should be divided -- that's a matter of contention. If you want to tackle climate change, you need ambition and political will. Brazil proudly supports the high ambition coalition. The coalition is a a group of developed and developing countries that are jointly pushing for an ambitious accord in Paris to curb global warming. It includes African, Caribbean and Pacific countries along with the United States and all EU members. India's environment minister says wealthy nations are not showing enough flexibility at the climate talks. Prakash Javadekar told reporters today that India wants a "just and equitable accord" that spares the world's poor from the "ill impacts" of climate change. "Unfortunately," he said, "the developing world is accommodating and the developed world is not accommodating and is not showing flexibility." He said the disagreements are focused on "differentiation" — how to define the responsibilities of countries in different stages of economic development. Wealthy nations insist the firewall between rich and poor countries must go — all must fight global warming. They say large developing nations such as China, the world's top greenhouse gas emitter, must also play a role in fighting climate change and helping the poorest countries cope with it. But a bloc of nations including India and China is resisting those efforts, saying wealthy nations including the U.S., Japan and European countries have more historical responsibility because they have polluted the atmosphere much longer. What’s carbon pricing and why is it so important? Carbon pricing is a way of imposing charges on those who emit harmful carbon dioxide, or carbon dioxide equivalents, into the atmosphere. It's being touted as a way to reduce the world's reliance on fossil fuels by encouraging polluters to cut down on the amount of greenhouse gases they produce. It is also argued that carbon pricing will encourage the development of new clean and affordable energy solutions. For how it can work, why it matters and why it's an important issue in the Paris talks, read the full explainer. President Obama spoke about the Paris climate talks by phone Thursday night with President Xi Jinping of China, the White House said Friday. Obama has been calling his counterparts in other countries this week to keep attention on the talks and has spoken with Indian Prime Minister Modi and Presidents Francois Hollande of France and Dilma Rousseff of Brazil. "Both leaders agreed that the Paris conference presents a crucial opportunity to galvanize global efforts to meet the climate change challenge. They committed that their negotiating teams in Paris would continue to work closely together and with others to realize the vision of an ambitious climate agreement. As the Paris climate talks wind down, activists are painting the traffic circle and streets around the Arc de Triomphe with a temporary yellow paint to represent a massive sun. The nonpolluting, water-based paint is expected to last for the rest of the conference and be visible from the air as people leave Paris, Greenpeace campaigner Frédéric Amiel said in a statement. U.S. Secretary of State John F. Kerry said he was hopeful that negotiators can finalize a landmark climate accord Saturday and has been working behind the scenes to reach compromises on contentious issues. He told reporters Friday at the talks outside of Paris "there was a lot of progress made last night, a long night, but still a couple of very difficult issues that we're working on." He said, "I'm hopeful ... it could come to a conclusion sometime tomorrow." The French hosts are aiming for a final draft Saturday, a day after the scheduled end of the two-week talks. Kerry said some envoys "have been working quietly behind the scenes to work out compromises ahead of time" but he would not elaborate on what those were. Kerry met Friday with French Foreign Minister Laurent Fabius and Indian Environment Minister Shri Prakash Javadekar. U.N. Secretary-General Ban Ki-moon says negotiators trying to finalize a sweeping climate accord are still in disagreement over how far-reaching it should be and who should pay for damages wrought by global warming. "There are still outstanding issues," Ban told reporters Friday in Le Bourget, outside Paris. Among them are "ambitions, climate financing" and so-called differentiation — whether big emerging economies like China and India should pitch in to reduce global greenhouse gas emissions and help the poorest countries cope with climate change. French Foreign Minister Laurent Fabius, who is hosting the talks, said after meeting with Ban that he was aiming to have a final draft accord ready by 9 a.m. Paris time on Saturday to present to the more than 190 delegations at the talks. Fabius stayed up most of the night in negotiations, and said he was resuming meetings with "all groups" Friday afternoon. 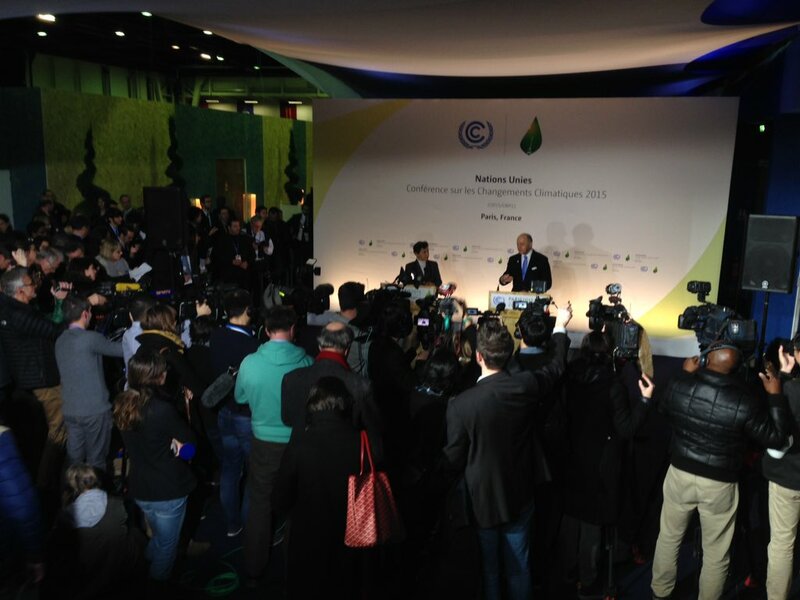 "We are almost at the end of the road," Fabius said. Ban said he was "convinced and confident" that they would reach an "ambitious, strong accord." A new and hopefully final draft of a climate deal will not be ready until Saturday, officials announced. The decision to give delegates more time came after another round of all-night negotiations at the conference center outside of Paris. French Foreign Minister Laurent Fabius has tried to prod participants toward compromise, but difficult disputes remain on issues that have divided countries for years. The biggest question at the climate talks right now is this: How good a judge is French Foreign Minister Laurent Fabius? Fabius is overseeing the negotiations as the host country’s chief diplomat, and on Thursday evening he presented his own version of a draft agreement. The new text is his effort to synthesize the positions of nearly 200 countries while also prodding them toward a final deal. There are still some key disagreements remaining, but the new text presents potential compromises on how countries will reduce emissions and when they’ll reconvene to scale up their ambitions. “Assuming [Fabius] is reading the room right, they’ve made a lot of progress,” said Nathaniel Keohane of the Environmental Defense Fund. Progress can be measured in part by the number of brackets remaining in the text. (The brackets represent disputed parts of the draft.) The last version, which was released Wednesday, had 300 brackets. The new one has only 48. One of the most fluid parts of the latest draft involves how countries will verify progress on emissions reductions. More than a dozen congressional Democrats who had been scheduled to attend the climate talks gathered on Capitol Hill on Thursday after the trip was canceled due to pending votes. 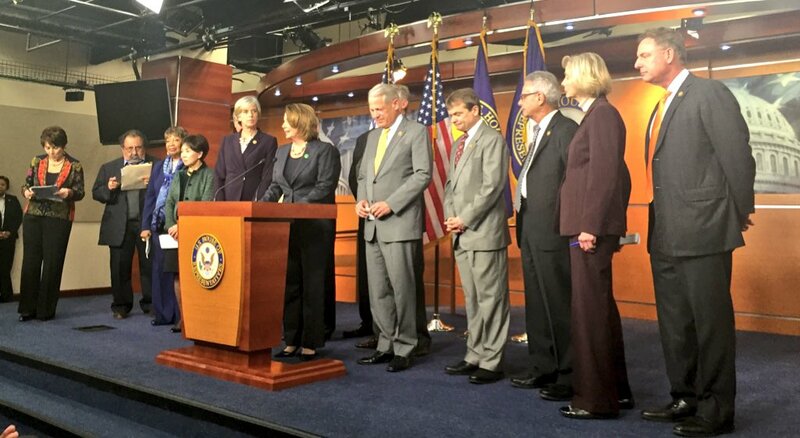 House Minority Leader Nancy Pelosi, one of eight California members who had planned to fly to Paris, praised Gov. Jerry Brown for attending the summit and for addressing climate change in California. "As a Californian, we have led in an extraordinary way," said Rep. Anna G. Eshoo (D-Menlo Park). The Democrats criticized their GOP counterparts, many of whom have denied the urgency of climate change. Rep. Jared Huffman (D-San Rafael) called Republican members of Congress "the last sanctuary of climate denial" and speculated that the House majority leadership may have scheduled key votes for Friday in part to force members to call off the trip. Several Republican House members were also scheduled to attend. As the Paris delegates pore over the latest iteration of the proposed climate deal, they may notice that a few key sticking points remain unresolved. It's becoming clearer that, even after this draft, there will likely be more work to be done. Leaders are scheduled to reconvene late Friday night. Want to read along? The full text of the latest proposed agreement is here . French Foreign Minister Laurent Fabius released a new draft of a climate agreement on Thursday night and outlined the steps he hopes will result in a final deal. Countries will have 2 1/2 hours to review the text before meeting again to hash out disagreements. When there's an impasse, Fabius said, small groups will step outside with 30 or 40 minutes to reach a deal. Each step is intended to force compromise before a final agreement is ready on Friday. Christiana Figueres, the top United Nations climate official, said Fabius has taken charge of the proceedings. "He is running a very tight ship," Figueres said. President Obama and French President Francois Hollande spoke by phone today about the status of negotiations at the climate summit in Paris, according to the White House. In their conversation, the presidents "underscored their firm commitment to work together to reach an ambitious and durable climate change agreement," the White House said. Obama also thanked Hollande for sending the Charles de Gaulle aircraft carrier to the Persian Gulf for naval strike operations, according to the White house. California has often been ahead of the curve on climate change, and the state's leaders have held up its policies as a global model. Here's a look at what those policies mean for residents in their daily lives, from driving their cars to powering their homes. We reported Wednesday that a stalemate on a stop-gap measure to fund the government caused House members to cancel a planned delegation to the climate talks. The Democratic members scheduled to travel to Paris will hold a news conference supporting President Obama's efforts at the conference later today. Through negotiating and promoting President Obama's landmark nuclear deal with Iran, Ernest J. Moniz became an unexpected Cabinet star. His Founding Fathers-style coif — flowing gray locks he says were inspired by years in California earning his doctorate at Stanford — also helped make him one of the administration's more recognizable faces. Now, the 70-year-old Energy secretary has turned toward helping Obama pursue another of his top second-term undertakings: a major international accord on climate change. He is part of the U.S. team at the United Nations climate negotiations underway in Paris. Sen. Barbara Boxer (D-Calif.) thanked climate negotiators in a statement Thursday morning and pointed to California as an example. "This agreement in Paris can be an economic engine, driving innovation and job creation throughout the world. Just look at my home state of California – California’s leadership in reducing emissions has been a boon to our state and to our economy," she said in the statement. She said an ambitious agreement out of Paris would drive economies around the world. This is our moment to take action. International migration officials want a global climate accord under discussion to address the growing risk of migration because of extreme weather. The director of the International Organization for Migration, William Lacy Swing, said the planet is seeing more forced migration today than any time since World War II, and experiencing what he called "unprecedented anti-immigration sentiment." "If we add the effect of climate change ... you really have the elements of a perfect storm," he said on the sidelines of the Paris climate talks "We are here ... to find out how to weather that storm." Jan Egeland, head of the Norwegian Refugee Council, said that "every second, a person is forced to flee because of an extreme weather event." At least 19.3 million people worldwide were driven from their homes by natural disasters last year, most related to weather events, according to the Geneva-based Internal Displacement Monitoring Center. With Gov. Jerry Brown on his way back to California, it seems like he's left some advice for negotiators still working on an international climate deal. The Latin phrase can be translated as "remember to maintain a calm mind while doing difficult tasks." A top aide to Gov. Jerry Brown posts a collage as he heads home. Negotiators were working until 5 a.m. here at the conference center outside of Paris, but there's been no progress on the most significant obstacles to a deal. Although there's little concern that the talks will fall apart, it's unclear how strong of an agreement will be reached to fight climate change. The French foreign minister is expected to release a new draft on Thursday evening in hopes of bridging some of the remaining differences. Here's an update from Chris Megerian on where things stand. Australian climate negotiators are worried that a proposed deal emerging in Paris isn't strong enough, according to a story in the Sydney Morning Herald . Speaking on behalf of a collection of non-European industrialised countries known as "the umbrella group", Australian lead negotiator Peter Woolcott said: "We are deeply disappointed at the weakening of several provisions." He said the group wanted an ambitious agreement that motivated all countries and did not bind them into historic static groupings - a reference to the long-term divide between developed and developing nations. "We must avoid a situation where, in an effort to reach consensus, we strip the Paris outcome of its ability to be a genuine step change," Mr Woolcott said. United Nations conferences are known as a source of difficult acronyms, but this one may take the cake. Judging by Gov. Jerry Brown's comments on Tuesday, one can imagine he wouldn't be a fan. At this phase of the negotiations on climate change, the conversation is much less about the science and much more about the money: specifically, who will pay for the damage that will be caused by global warming and the clean energy programs that are needed in developing countries. Christina Boyle has a rundown on what's become a sticking point at the United Nations summit, which is supposed to wrap up Friday but could go into overtime. Gov. Jerry Brown is leaving Paris on Thursday morning, but not before one more interview with reporters. We rode with him to the airport to get his thoughts on the conference and see what his plans are for new climate initiatives next year. "I've never seen so many people walking around talking about climate change." Chris Megerian interviewed Gov. Jerry Brown as he headed home to California. The Democratic governor told Megerian he is preparing to wade into next year's crowded field of ballot battles in the Golden State. That could include proposing a new effort on climate change or fighting off an initiative to restrict infrastructure projects. Brown has, between two accounts, about $24 million in campaign cash left over from last year's gubernatorial contest.